I started the week with a broken air conditioner and the thought of having to cook, photograph, and write about a hot meal couldn’t have been further from my mind. In some areas of the country, having no air conditioning in July is no big deal. However, here in south Texas for a city girl like me, it’s a really big deal – a hot, sweaty, generally uncomfortable big deal. So, we were forced to face the reality that our 30 year old AC system was dying and needed to be completely replaced. The repair company loved us. Happy ending to the story is that we now have a brand new system that works more efficiently and doesn’t sound like a freight train when it turns on. The down side is that our kids may not get to go to college. Just kidding, kids! Maybe. Once the house was pleasantly cool again, I could think about cooking but I still didn’t want to turn on the oven or stove. 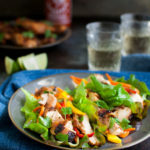 Enter the grill and these grilled chicken lettuce wraps. You can’t beat grilling when you’re in need of a cool summer meal. This marinade is one of the best I’ve ever tried. Chicken can be a little boring but this Asian inspired marinade perks it right up. It’s a little sweet, a little spicy and full of amazing flavor. Pair the slightly smoky and beautifully browned chicken with a refreshing and light slaw and you might forget it’s 100 degrees outside. This recipe uses boneless chicken thighs with the skin on which is a little harder to find than boneless, skinless chicken thighs but is totally worth the extra effort to get. I have found that the butcher at the meat counter will happily de-bone some chicken thighs for me on request. Keeping the skin on the chicken helps keep the meat stay juicy while grilling. You can always remove the skin after the chicken is cooked though those crispy bits of skin really are quite tasty. The recipe for the slaw is really flexible. You can vary the amount of carrots, cucumber, herbs, and mango depending on your tastes. In fact, for my family, because we have such differing tastes regarding cucumbers and fresh herbs, I just left all the slaw components separate and let everyone top their wraps individually. And everyone was happy (and cool). In a large bowl, whisk together the lime juice, soy sauce, brown sugar, fish sauce, Sriracha, garlic, cilantro, and green onions. Add the chicken to the marinade and turn to coat. Also, coat the chicken under the skin by gently loosening the skin from the thighs with your fingers and allowing the marinade to flow under the skin. Cover and refrigerate for 3 hours. Prepare grill for medium-high heat. Remove chicken from the marinade and season chicken with salt and pepper. Discard the marinade. Grill the chicken, turning occasionally, until the skin is crispy and the chicken is cooked through, about 15 minutes. Transfer the chicken to a cutting board and let rest for 5 minutes. Whisk together rice vinegar, sugar, and salt in a small bowl. Add carrots and cucumbers and toss until combined. Let stand at room temperature for 10-15 minutes, stirring occasionally. Drain the carrots and cucumbers. Stir in the cilantro, mint leaves, and Fresno chile. Add the mango strips and gently toss together. Slice the chicken and serve in the lettuce leaves, topped with the slaw. Add squeeze of lime juice, if desired. Recipe adapted from Food and Wine, June 2016.